Drones have become an almost daily sight for many people and their popularity is catching on for both personal use and in a number of different industries. The right drone for any individual is going to depend on a number of different factors, starting with what they are using it for. Today RC Hobby Review is going to be looking at the best drones under $1000 you can buy in 2018. With thousands of drones currently on the market, ranging from a few dollars to several thousands of dollars, it can be hard to sort through the vast number of features to find just the right drone for you. Here, we've curated a collection of some of the top photo and video drones available for less than $1000. At that price point, however, no matter how user friendly it is, you probably don't want to "give it a rip" without having a least some experience at piloting a drone. Before you go drop a grand on a Pro-sumer drone, here's a l﻿﻿﻿ist of some entry level drones﻿﻿﻿ you might want to practice on first. See below for our top picks for the best drones under $1000. Click on the links to view the item on Amazon! It’s not a coincidence that three of the top rated drones are all made by DJI. DJI is the world's leader in the civilian drone and aerial imaging technology industry, accounting for 85% of the global consumer drone market. They genuinely produce phenomenal products, utilizing advanced technology that makes them both user friendly and durable at the same time. 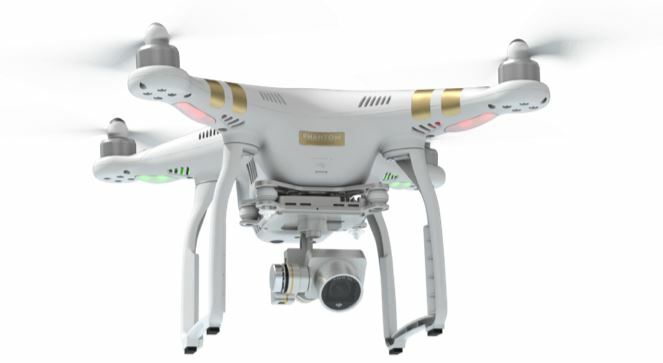 The Phantom 3 comes in three different levels, Pro, Advanced and Sta﻿﻿﻿ndard. The Pro and the Advanced are both top rated drones under $1000. 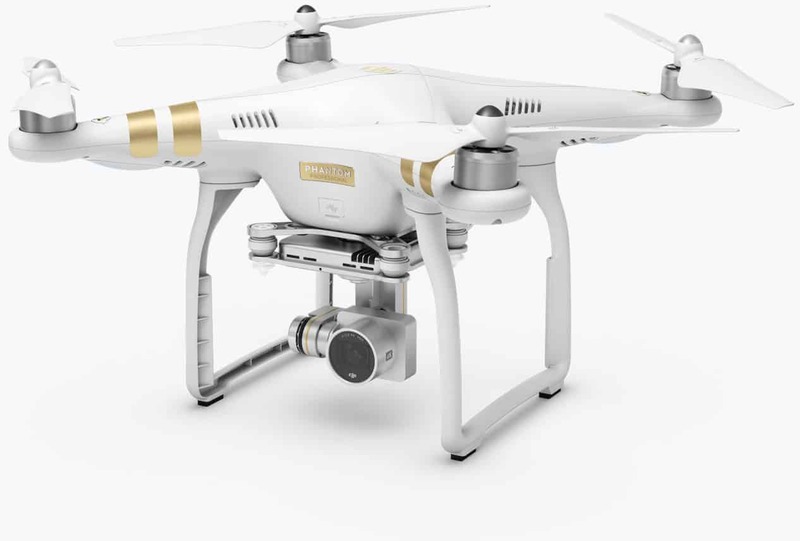 The Standard drone is also an excellent drone but comes at a significantly lower price point, which is why it is not on this list.The DJI Phantom 3 Pro is arguably the best drone for under $1000 you can buy at the moment. The Phantom 3 Pro is significantly larger and heavier than the Mavic Pro, which means you can’t just throw it in a bag or backpack like the Mavic Pro. Conversely, however, the size and weight of the Phantom 3 make it better for use in less ideal weather conditions and offers a significantly greater ability to deliver longer shots that are smooth, steady and stable throughout. The Phantom 3 Pro also uses many of the same technologies that make the Mavic Pro such a great option for beginners or amateurs, but includes more advanced features, making it a more attractive option for more experienced pilots. It also features an advanced camera, which makes it a more attractive option for more professional photographers, videographers and filmmakers. Since many of the basic features of the Phantom Pro 3 – such as a controller that utilizes a smart phone or tablet - are covered below in the review for the Mavic Pro, I’ll stick to what’s different or advanced in the Phantom 3 Pro. Although this feature is the same as the Mavic Pro’s, the Phantom 3 Pro takes it to the next level by combining it with GLONASS (Global Navigation Satellite System) which allows it to hover even more precisely and accurately and locks onto satellites much faster. With the DJI Go app, you can even track its location on a live map and record your takeoff point so you can call it back with just a simple tap of a finger. When you release the control stick, the Phantom 3 immediately stops and hovers in place. The Phantom 3 Pro processes information from a vast array of sensors and completes a mind-boggling array of calculations in real time so it actually helps you fly –which allows you to focus on getting great shots and gives you a totally worry-free flying experience. The Phantom 3 Pro actually logs and remembers details of every flight you take, including flight route, time, distance and location. It also caches thumbnail versions of any photos or videos you took during the flight for future reference. In addition, the Phantom 3 is constantly recording data from its own interior mechanisms which you can choose to share with DJI’s support team in the event of an problems or malfunctions. 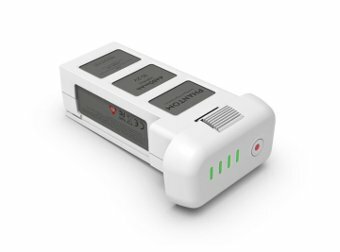 The Intelligent Flight Battery has a number of built in sensors that can detect the exact status of the battery and give you remaining power data in real time through a series of bright LED’s. A higher voltage and more power and energy combine to give you a significantly improved flight experience. The Phantom 3 is also capable of continuously calculating its own remaining battery power and current distance to determine just much charge it needs to return, so you always know exactly how much time you have remaining for flying. Brushless motors work with lightning-fast Electronic Speed Controllers (ESC’s) to make your Phantom 3 fast, agile, and responsive. Motors with ESC’s give you the ability to speed up quickly and rapidly increase or decrease altitude, while DJI’s powerful air braking mechanism allows you to stop on a dime. The ESC’s not only relay vital motor speed information to the Main Controller, but also send commands based on your input back to the motors. This constant back-and-forth communication keeps the Phantom stable during flight, allowing you to capture everything from gentle pans to smooth shots during rapid acceleration. Performing dynamic aerial maneuvers requires a superior stabilization unit. The Phantom 3 contains an Inertial Measurement Unit (IMU) that utilizes a 6-axis gyroscope and an accelerometer that is constantly working to detecting the slightest changes and compensate for them automatically. Aerodynamic self-tightening propellers will stay firmly in place no matter how erratically you fly. The Main Controller of your Phantom 3 collects massive amounts of flight data from the entire system, including the IMU and ESC’s and analyzes it in real time. This includes command inputs, GPS location, motor speed and information from a full array of automatic sensors. The controller analyzes data on the spot to tell your Phantom 3 exactly how to behave or respond at any given moment. The Phantom 3 operates on a fully customizable platform that allows you to program apps that meet your individual needs. The Phantom 3 Pro is Ultra HD 4K capable at 30fps and utilizes a 12 MP camera with an f/2.8 lens that helps eliminate unwanted distortion. Below are two photo's displaying actual images taken by the Phantom 3 Pro. 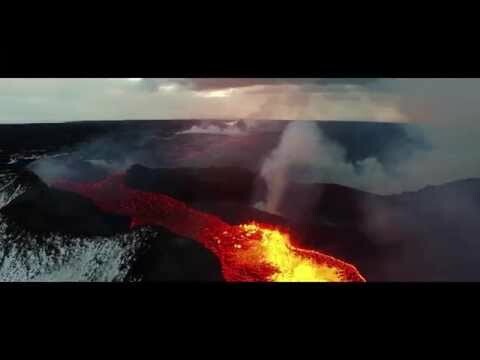 ​​Amazing Phantom 3 Pro footage taken in Iceland of the Bardarbunga volcano ! Check Out Amazon's Great Price! The DJI Phantom Pro is for more serious professionals who need higher performance and aren't as concerned with portability. The Phantom Pro takes our number one spot for the best drones under $1000. Check Out Amazon's Great Price For The Phantom 3 Pro! DJI is one of the top names in drone technology and the Mavic Pro doesn't disappoint. One thing you can definitely count on with DJI is high performance and reliability. Anyone familiar with Apple knows that they curate only the highest quality products to sell in their Apple stores. When it comes to drones, DJI tops their list, which means their products deserve a serious look. DJI products are also certified by Apple in their Works with iMovie and Works with Final Cut Pro X programs, so if you are a Mac/FCP user, then you can shoot with confidence knowing there won't be any export issues. This drone could arguably be one the best DJI drone under $1000. If ease of packing around a drone is the deciding factor then the Mavic Pro is the drone for you. The Phantom 3 Pro has a slight advantage with a wider field of view on the camera and the Mavic camera requires the focus to be set manually each flight. Probably the best feature of the DJI Mavic Pro is its size. The wings actually fold up into the unit and when folded, the quadcopter is small enough to fit in a purse, messenger bag or camera bag. Weighing only 1.62 lbs, it also won't weigh you down, no matter where you take it. When unfolding the wings, they "lock" into place, so there is no worry about a wing snapping out of place mid-flight. In spite of its compact size, however, there is no question of the Mavic Pro being a solid piece of equipment well worth its price tag under $1000. Don't let its tiny size fool you about its capabilities either. 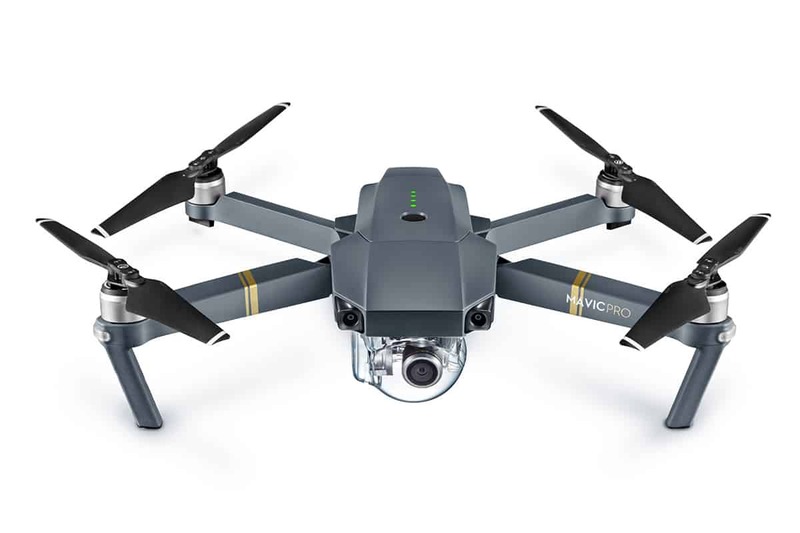 The minuscule body hides a monster degree of technological complexity that makes the Mavic Pro one of the most sophisticated camera drones on the market. It features 24 high-performance computing cores and an advanced transmission system that is capable of streaming 720p HD at a range of up to 4.3mi (7km). Shorter ranges offer the capability of streaming in full 1080p HD, while video can be recorded in full, dynamic Ultra 4K at 30fps, with no Electronic Image Stabilization. This means all recorded footage, is full rich bona-fide 4K – shot on a 12-megapixel camera with Adobe DNG RAW support. 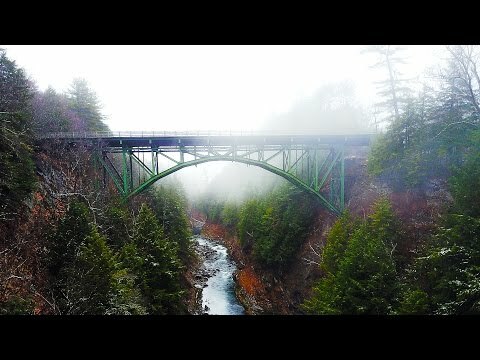 Here is a sample of video shot with the Mavic Pro. "DJI Mavic Pro" by Leigh Miller is licensed under CC BY 4.0. The Mavic Pro is packed with features that allow amateurs to operate like pros and pros to operate like NASA personnel. A miniaturized, ultra-precise 3-axis gimbal is capable of stabilizing the camera even during high-speed motion for smooth video and sharp photos, while satellite positioning technology helps the drone remain almost stationary while hovering in an unobstructed outdoor area. Forward and downward vision sensors also allow the drone to hover incredibly precisely, even while indoors or in areas with no access to GPS. The Mavic can hover almost perfectly still or fly (and shoot video) up to 40mph in Sport Mode. FlightAutonomy technology allows the Mavic to sense obstacles up to 49 feet (15m) away and respond appropriately by bypassing them, braking or hovering. This also protects the drone when descending from an inadequate height when it is in Return to Home Mode. One of the most tricky maneuvers for novice pilots is simply flying in a straight line. It takes time to become familiar enough with joysticks to be able to fly and operate the camera at the same time. The TapFly features allows you to simply tap where you want the Mavic to go and it will fly smoothly in that direction, leaving you free to focus on controlling the gimbal and capturing great photos and video. The latest feature on the Mavic Pro is Tripod mode, which slows the Mavic down, making every movement slow and precise for sharp, crisp, detailed photos and videos. This tech feature allows you to designate a specific person for the camera to track and Mavic Pro does the rest. This mode allows you to make a simple gesture to tell the Mavic Pro to snap a photo – making it easier than ever to get great “Dronies”. The included controller actually operates via a smartphone (both iPhone and Android cables are included), but it also offers Bluetooth technology that allows you to operate the drone using just your phone. Users have also reported that the controller will also easily accommodate an iPad mini or other smaller tablet. Lightweight portability allows you to take it with you so you have it on hand right when you need it most. Never lose a great shot you could've had if you your drone with you! Being small, light and portable is a plus when you are carrying it around, but it also makes it more susceptible to damage due to high, sudden or unexpected winds. Many users reported it still working quite well in moderate winds, but weight will always be a factor in any flying module. The heavier it is, the more stable it is. The Mavic Pro is great for novice or amateur videographers or filmmakers, or those who just want the ability to take quick "Dronies" of their adventures. Being small, light, and portable is a huge advantage as long as the weather and terrain cooperate, but can be a disadvantage if you need to use it in poor weather or adverse conditions. The Mavic Pro will cost you a few hundred dollars more, but like we said if portability is important to you then the extra few hundred dollars may be well worth it. The advanced features of the Mavic Pro also help novices get great shots without a huge amount of experience at operating a drone. All of the great features of this drone push it to number two on list for the best drones under $1000. 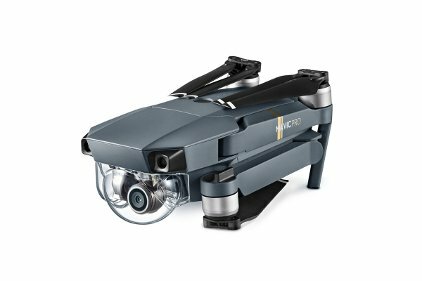 Check Out Amazon's Great Price For The Mavic Pro! Autel has also not been left behind when it comes to drone technology. They have also built one of the best drones that you can get for less than $1000, the Autel Evo Drone. 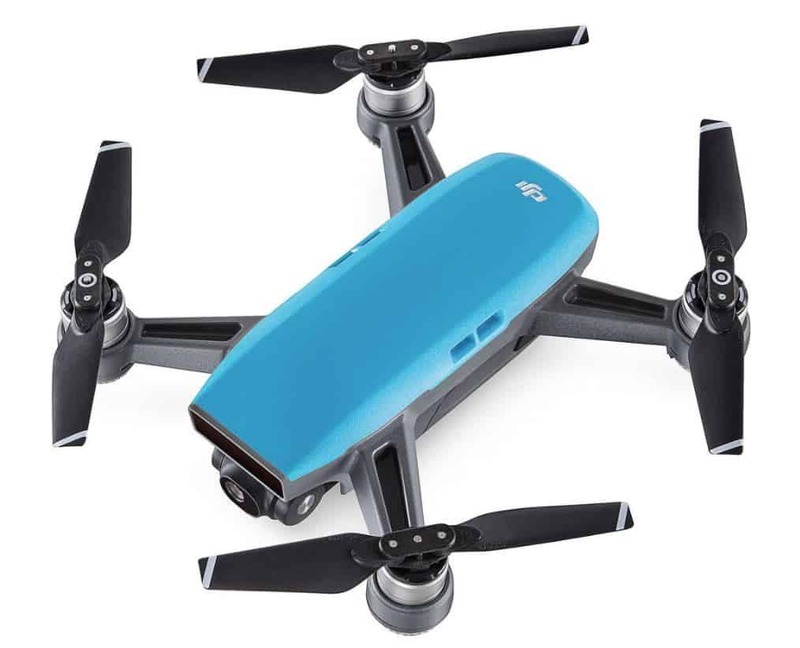 If you are looking to take quality aerial pictures and videos, you can depend on this drone because it is fitted with some high quality features. This drone has a sturdy and ergonomic design to make its operation a lot faster. It also has an orange color that enhances its visibility in the air. The EVO is fitted with intelligent flight technology for an easier flying experience. It is built with rear and front sensors that help it to avoid obstacles along its path. One of its most impressive features is the 4K UHD camera that captures images and videos at 60 FPS. What’s more, it has a 3-axis gimbal that enhances the camera’s stability enabling it to capture smooth videos and crisp images even at high speeds. Even with a sturdy construction, Autel EVO Drone is foldable to allow you to travel with it to whichever destination you would like to take your images from. That is not all; the drone has a remote controller, which is fitted with a 3.3-inch OLED screen that delivers live HD dual band transmission. Moreover, it has an excellent range of 7Kms, allowing you to take images over a wide field. If you love taking high quality images, you can never go wrong when you are using the Autel Evo Drone. This is because its camera is designed with excellent specs such as a field of view of 94◦. Moreover, it features different modes such as burst, single, time-lapse, and AEB. It is also fitted with a Sony CMOS 1/2.3-inch sensor and an Ambarella H2 image processor. In addition to the enhanced sensitivity, its camera also supports multiple file formats: MOV or MP4 for videos and JPG or DNG for photos. In case you experience an issue with your drone or have an enquiry, Autel Robotics offers you 7-day-a-week customer support. Interestingly, it is compatible with Android and iOS devices. • The drone is compatible with iOS and Android devices. • It features a sturdy construction. • The drone comes with 4K UHD video with 94 degree FOV. • It allows you to access different flight modes. • You can customize it to your preferred settings. • In case of camera upgrades, you can only consult Autel Robotics. • The drone’s batteries take a considerable amount of time to charge. This is a suitable drone for the intermediate and professional photographer that is looking for a drone with outstanding camera capabilities at an affordable price which is easily why it made the cut in our best drones under $1000. Check Out Amazon's Great Price For The Autel Evo Drone! 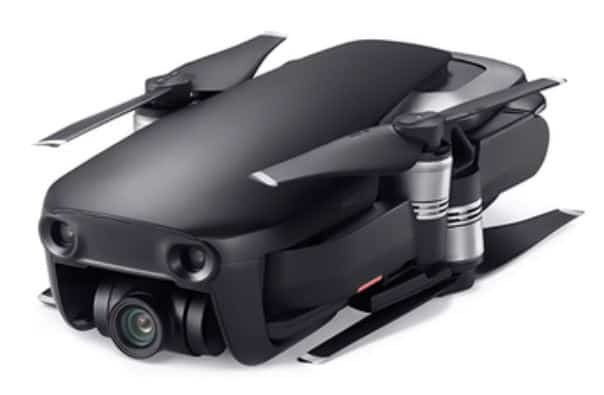 If you are looking to save money but still wants a drone with all the high quality features, you might consider starting with the DJI Mavic Air. Despite its low price, the drone will guarantee you of a flawless performance. Mavic Air comes with FlightAutonomy technology that enables it to sense obstacles up to 49 ft. away. This feature prevents the drone from hitting obstacles along its path. Whenever it encounters an obstacle, the Mavic Air can hover or circumvent around it. Using this drone, you can take pictures and videos over a wide range. When Mavic were designing this drone, they fitted its remote control with OcuSync technology, which has a great transmission distance. It has a range of up to 7kms (4.3 miles). It also streams HD videos – capturing 1080p at a short range and 720p at a long range. Furthermore, this drone supports 4K videos at 30FPS. For better image stabilization, the drone is fitted with a 3-axis gimbal that ensures you can capture crisp images and excellent videos even when the drone is flying at high speeds. Interestingly, Mavic Air is a compact and lightweight drone, factors that enhances its portability. Do not let its size mislead you into thinking that it has shallow performance; Mavic air comes fitted with high-performance motors with a flight time of up to 27 minutes. It also has a top speed of 43mph. That is not all. DJI Mavic Air comes with a GPS and Vision Position-Based Navigation. This is an effective feature that allows you to pinpoint the location of the drone. It also has satellite positioning that allows it to hover without drifting. 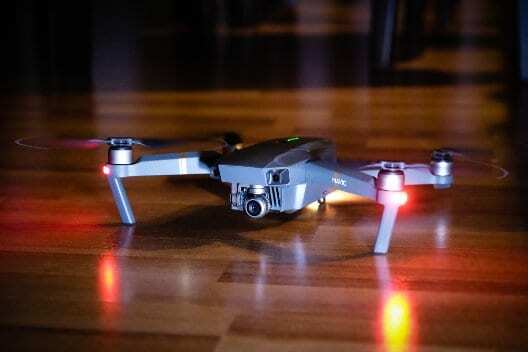 What’s more, it includes a tripod mode that increases its precision by allowing you to fly slowly. This is an ideal feature for people who would like to use the drone indoors. This feature makes the drone popular among real estate investors. It is also built in a manner that allows it to fly at an even height regardless of the terrain. It also has TapFly, which allows it to fly smoothly in certain directions. This feature allows you to focus more on taking quality pictures instead of flying the drone straight. • The drone has a compact and lightweight design. • It has excellent flight time. • The drone’s camera captures high quality videos and images. • It has a great range. • Its design includes sensors that prevent collision with obstacles. • The drone is easy to use. • Mavic Air does not have such a good range in the city. 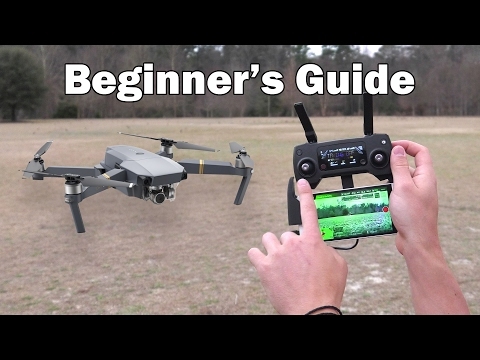 The drone is ideal for a beginner who is looking for an affordable yet high quality drone. Those in real estate can also depend on it for taking images and videos of property. Check Out Amazon's Great Price For The DJI Mavic Air! Just when we thought drones could not get any smaller, DJI went on ahead to manufacture SPARK Fly More Drone Combo. This is an excellent, affordable drone whose compact design allows you to carry it anywhere. It can even lift off from the palm of your hand. Despite its small size, do not be fooled into thinking that this is a toy. This is because SPARK Fly is a drone that features excellent performance and it an excellent drone under $1000. This drone’s design is ideal for those that love taking selfies, a group that is popularly known as dronies. You can control the drone by just the wave of your hand to capture some of the best images. This is made possible by the infrared sensors fitted on its front side. You can also control the drone using your mobile phone because it has an inbuilt Wi-Fi module that enables you to use your phone to control it. Just like Mavic Air, this drone is fitted with sensors that help in obstacle avoidance as well as giving it intelligent flight modes. This drone comes in bright colors, which help to increase visibility as it hovers in the air. However, be cautious when using it in windy environments as it tends to sway a lot. You can travel with this drone easily because its propellers are foldable to convert it into a smaller package. The drone features a top speed of about 30mph, and it comes fitted with a two-axis gimbal, which is not as effective as a 3-axis gimbal but works efficiently. It also does not take 4K pictures and videos, but its 1080p camera delivers excellent image quality. Landing it on your arm or softer grounds would be ideal with this drone because it has small feet that make it hard to land on rocky grounds. Fortunately, it has stabilization technology to keep it afloat. This drone has a maximum flight time of approximately 15 minutes. It also comes with a 1-year warranty; you hardly have to worry about its longevity. • The drone has automatic quickshot modes. • It can be controlled through gestures. • It has a mechanically stabilized camera. • Its design facilitates USB charging. • It has a short flight time. • You may need to buy extra batteries. • It is swayed easily by the wind. This is an ideal device for those looking for a small, compact, and affordable drone. It is also good for those who love taking selfies making it a worthy inclusion in our best drones under $1000. Check Out Amazon's Great Price For The Spark Fly! Conclusion: What is the Best Drone Under $1000? There you have it, our list for the best drones under $1000. Hopefully you are now more informed about the capabilities of these awesome drones. Although there are more expensive drones on the market, we tried our best to keep this list under a grand. Which ones are your favorites from this list? Feel free to leave a comment below! Looking for something a little lower in price? Then check out this l﻿ist of drones under 500 or an even lower price like our best drones under $300. 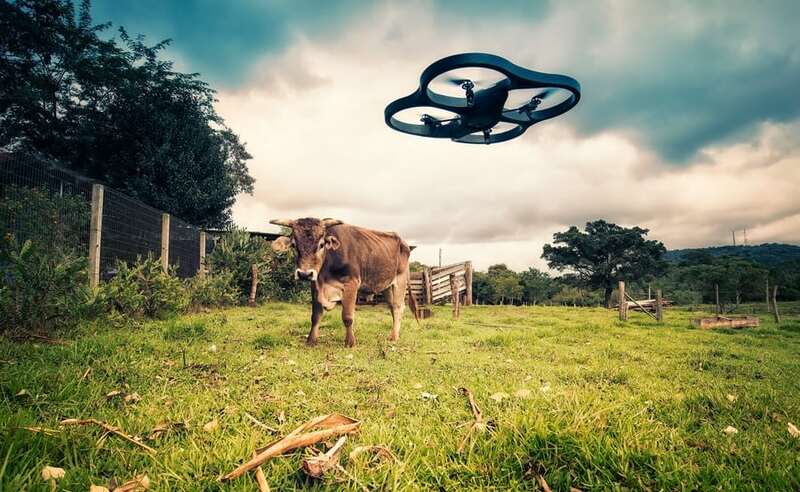 If you are a beginner and looking to learn to fly you should check our "How to Fly a QuadCopter - The Ultimate Guide"
"Drone vs Cow" by Mauricio Lima is licensed under CC BY 4.0 is the featured image in this post. Cool list of high-end drones. Pretty good info on the Mavic Air. Thank you! Thanks Tucker! Glad we could help you.